Liberty, Ellis, and the harbor. National Parks Service. Our culture has long wrestled with deep philosophical questions about the relationship between labor and liberty, none of which will be answered by this paddle tour. But we hope you end the day with wonderful memories and a greater appreciation for harbor history, estuary tidal forces, and urban planning ideas. We’d be grateful for donations or a sponsor for this paddle, to support our growing and needed educational and youth programs. Email tours@harborlab.org if you’d like to join us, with the subject line “Labor and Liberty.” Also join our Facebook event for this paddle. 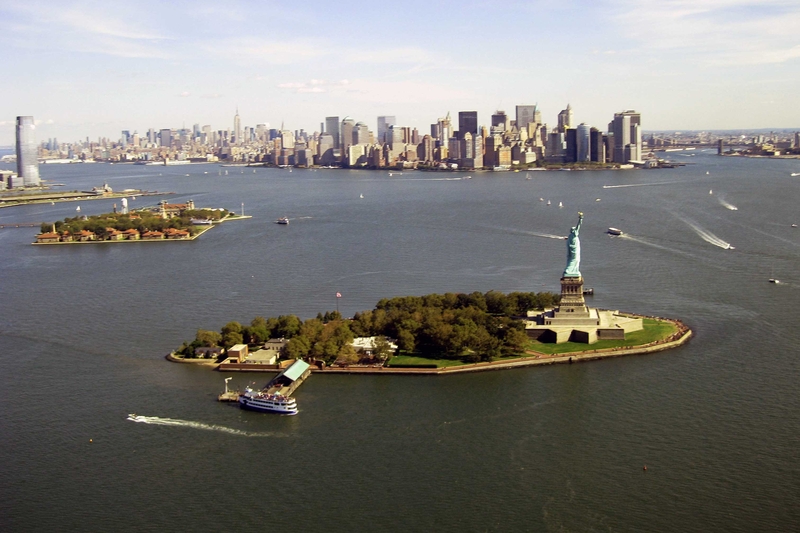 We’ll launch from LIC (Hunters Point South), land at Governors Island for a tidal break, cross the harbor at near slack to the Statue of Liberty and Ellis Island (respecting security zones), and land at the Porte Liberte canal village in Jersey City for lunch. 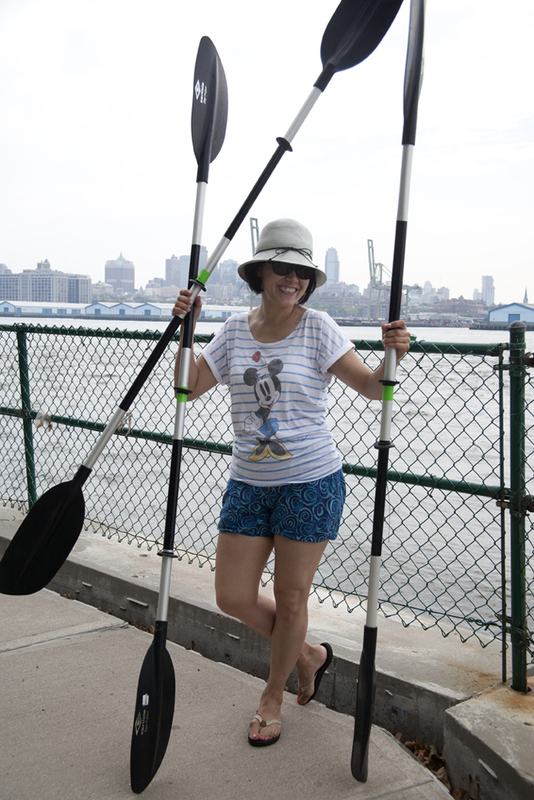 Then we’ll paddle straight back to LIC, perhaps resting in DUMBO. 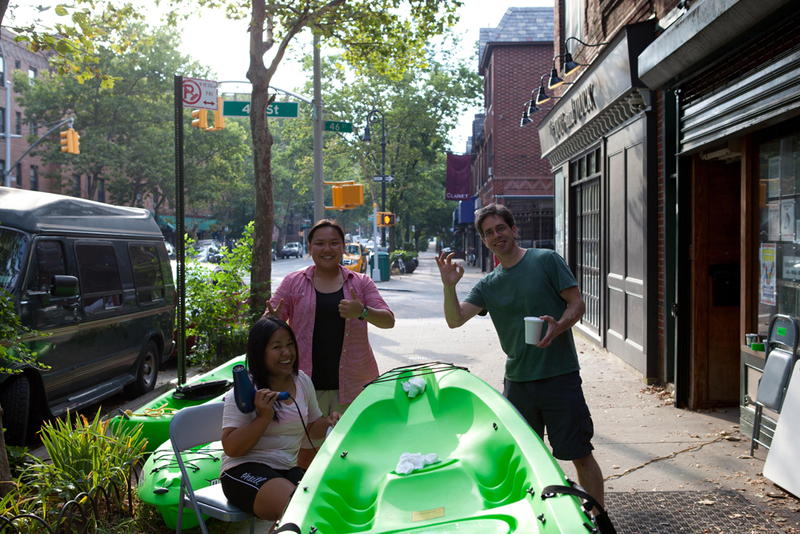 What development lessons does Porte Liberte hold, in terms of “dos and don’ts,” for NYC inlets, creeks, and canals? This is a very demanding paddle and crosses larger vessel traffic and waters with a long, exposed fetch. Please be very mindful of this and take safety instructions, to be sent to participants, to heart. We use the traditional tidal current benchmark of The Battery for our planning. This is for a holistic view of water movement throughout the harbor. Tides for New York (The Battery) starting with September 1, 2013. 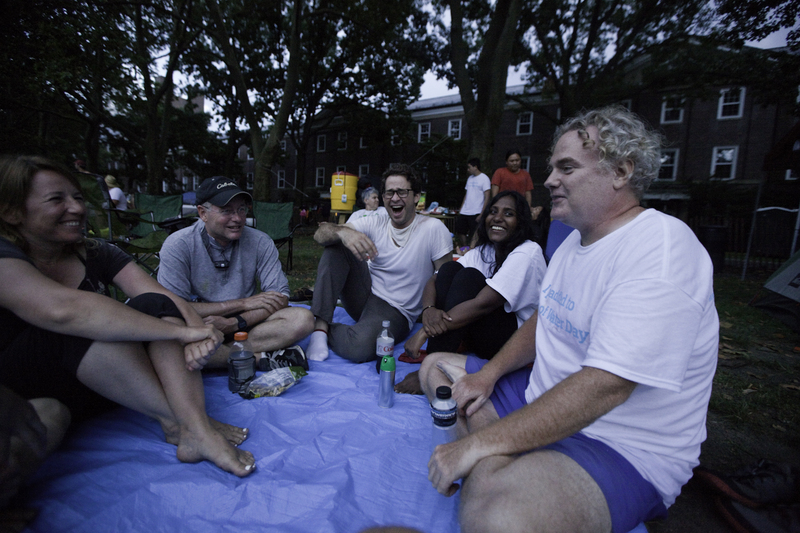 10am: Gather at Natural Frontier Market (12-01 Jackson Ave , LIC, NY 11101). 1PM: Land at Governors Island (we’re likely to land earlier). 1:30pm: Launch from Governors Island. 3PMpm: Land at Porte Liberte. Porte Liberte. Google satellite image. 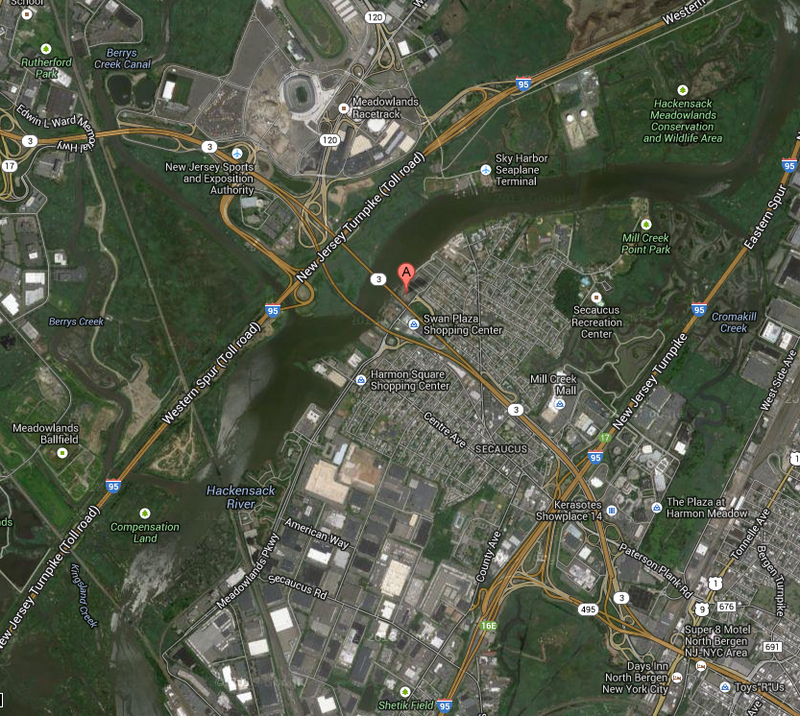 The launch is quite close to the Hackensack Meadowlands Conservation and Wildlife Area. HarborLAB will paddle the beautiful and recovering river called Hackensack, from the Lenape word Achinigeu-hach, or Ackingsah-sack, “meaning flat confluence of streams.” More about the waterway from the indefatigable Hackensack Riverkeeper (http://www.hackensackriverkeeper.org/history.html). Our thanks to Extended Stay America hotel for trailer parking and launch access. The launch is near the Hackensack Meadowlands Conservation and Wildlife Area. 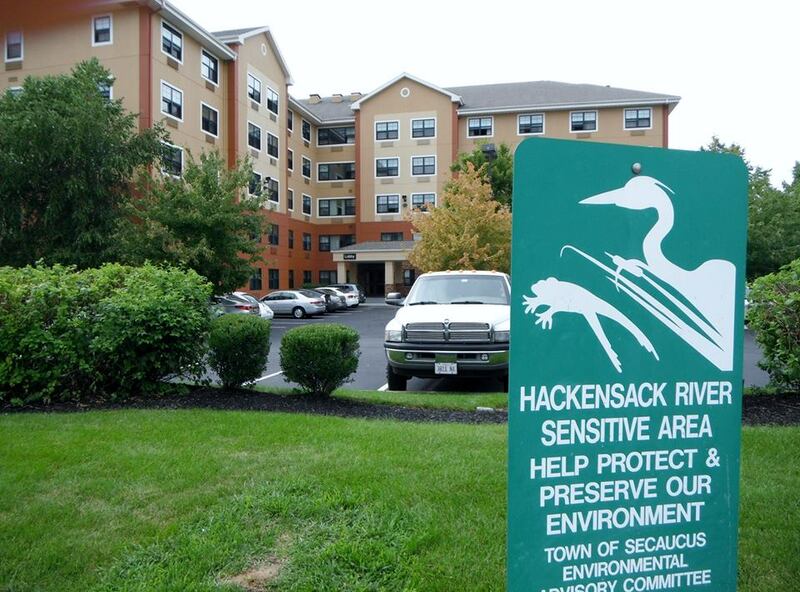 We would welcome the public the Hackensack Riverkeeper serves to join us, and its staff or members, and for others from outside the area to join the exploration. Total capacity of 20, with volunteers and students getting priority. We might be able to offer some rides, and our boat trailer might have capacity for private boats. Wesley Miller will coordinate the trailer loading. Email tours@harborlab.org with the subject line “Hackensack Bushwhack” if you’d like to participate. Please fill out and bring a waiver ahead of time if possible. Also join our Facebook event page. This will be a casual paddle to explore, learn, and enjoy each other’s company. Paul Baker will lead this trip and sets its final schedule. We aim for high water so the ramp is less muddy. 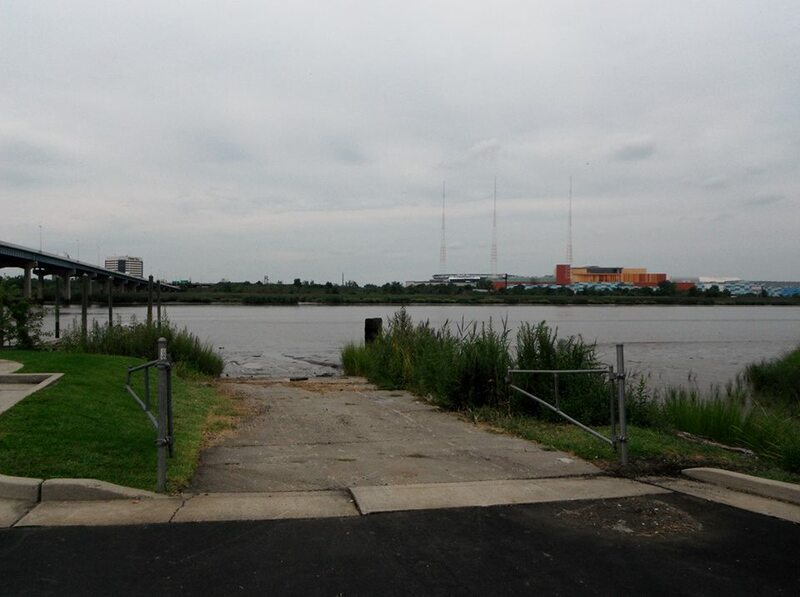 Tides for North Secaucus, Garretts Reach starting with August 24, 2013. Join the OMEGA Exploratory Paddle! Come paddle into the future! (We’ll stop for ice cream along the way). 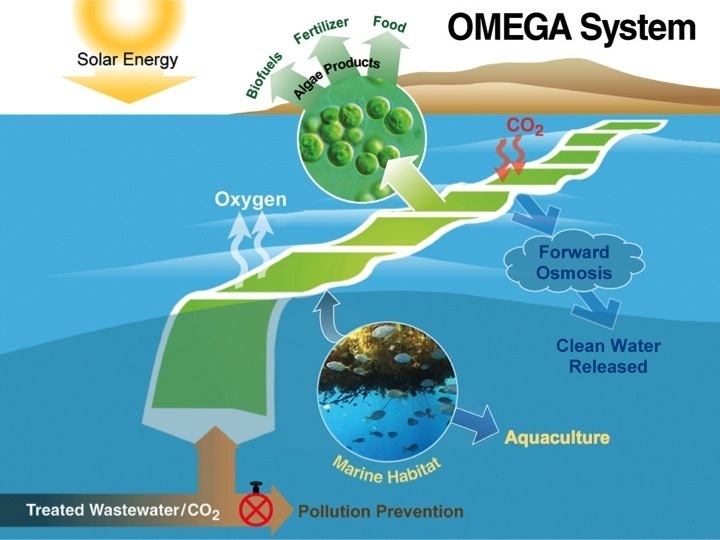 HarborLAB will be receiving seed funds this month (announcement coming) to work with students to build a small, prototype photobioreactor on the Newtown Creek Superfund site modeled on the NASA’s project called OMEGA — Offshore Membrane Enclosures for Growing Algae. HarborLAB’s vision is to work with students to grow clean, green fuel in membranes floating on a waterway polluted by the largest U.S. urban oil spill. 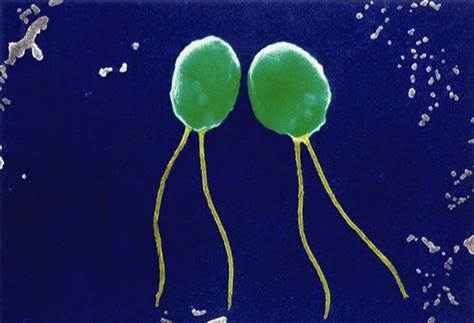 Algae chosen for biofuel potential would harness sunlight on the open surface expanse and derive nutrients from treated water from the Newtown Creek sewage plant. How poetic is that? 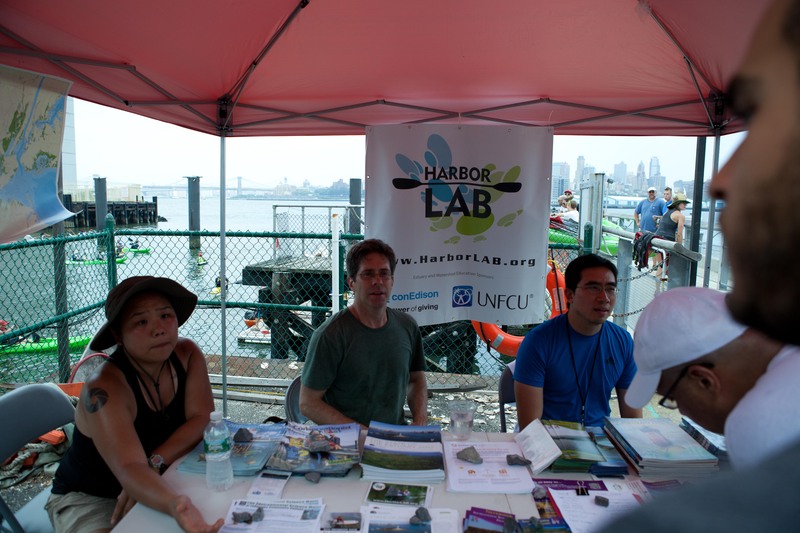 HarborLAB hopes to undertake OMEGA Newtown Creek as a project that will enrich the educational experiences of students at LaGuardia Community College and other area schools. 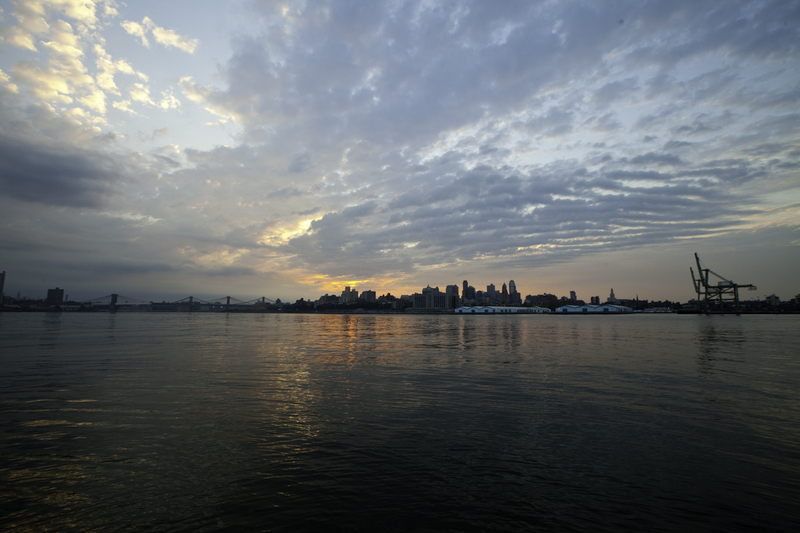 As OMEGA Newtown Creek grows, we’ll welcome other nonprofit partnerships. One of our sponsors, Arup, is leading Hunters Point South park and infrastructure development at the Newtown Creek mouth and in Germany built an algae-powered building. 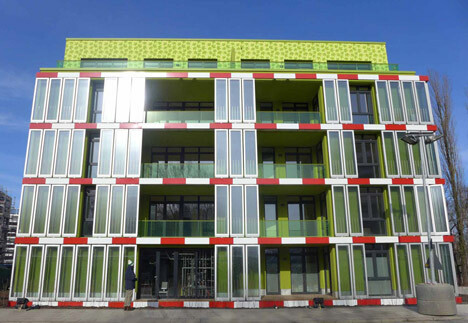 HarborLAB sponsor Arup building in Germany with a photobioreactor skin. On August 25th, we’ll be installation site scouting and generally exploring the creek, which tells uniquely instructive ecological tales. We’ll soon name our canoes for local and renowned environmental heroes — we hope Bernie Ente, Jenni Jenkins, and Rachel Carson would get a kick out of the NASA OMEGA Project. To participate in this paddle, please be at least 18 years old. Email tours@harborlab.org with the subject line “OMEGA Paddle.” If possible, please email with your signed waiver form (https://harborlab.org/waivers/) attached. You can also visit our Facebook event page. BONUS: We’ll stop by Brooklyn Ice Cream Factory on the Greenpoint side before heading back. OMEGA might be especially suitable for the sheltered waters of Newtown Creek, away from destructive wave action. We’re in touch with NASA’s OMEGA project lead scientist Jonathon Trent, Ph.D. to learn as much as we can. We’re a long way from implementation (classroom and lab work, further funds, permits, curricular integration, etc. ), but it starts Sunday, August 25 with a canoe paddle to assess possible installation sites. Oyster seed. Photo by Solar One, another participant in the estuary-wide seeding effort. 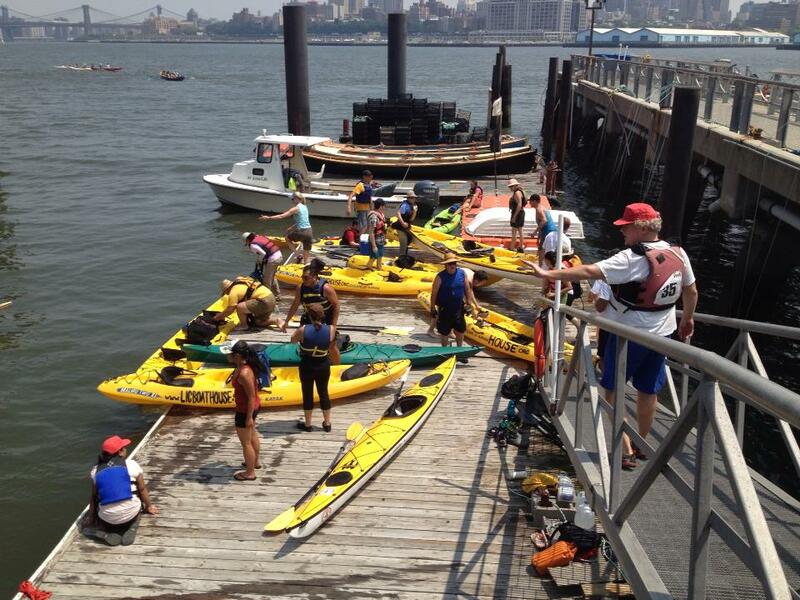 HarborLAB will take teachers from the Hunters Point Community Middle School on a paddle from LIC to Governors Island (no landing) to pick up oyster seeds from the New York Harbor School. This is a great chance for the school to learn about NY Harbor School‘s innovative curriculum. 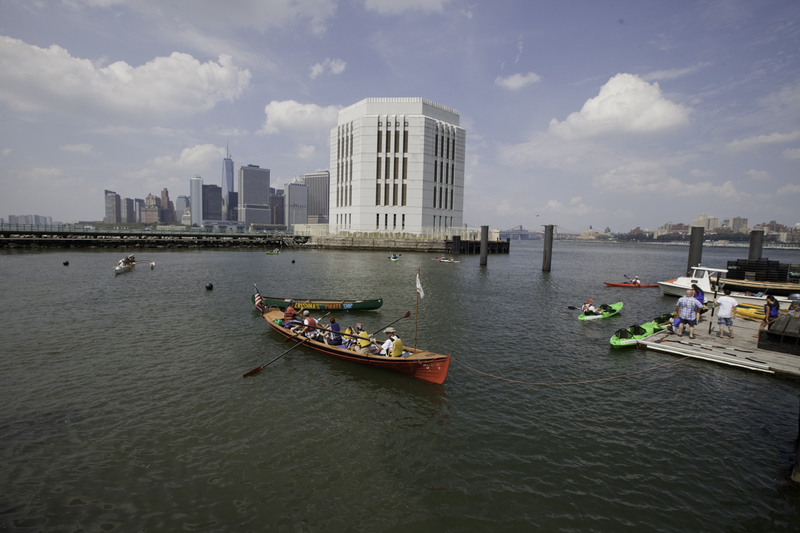 We’ll then paddle to back to Hunters Point and beyond to Socrates Sculpture Park, where the oyster seed platform will anchor. 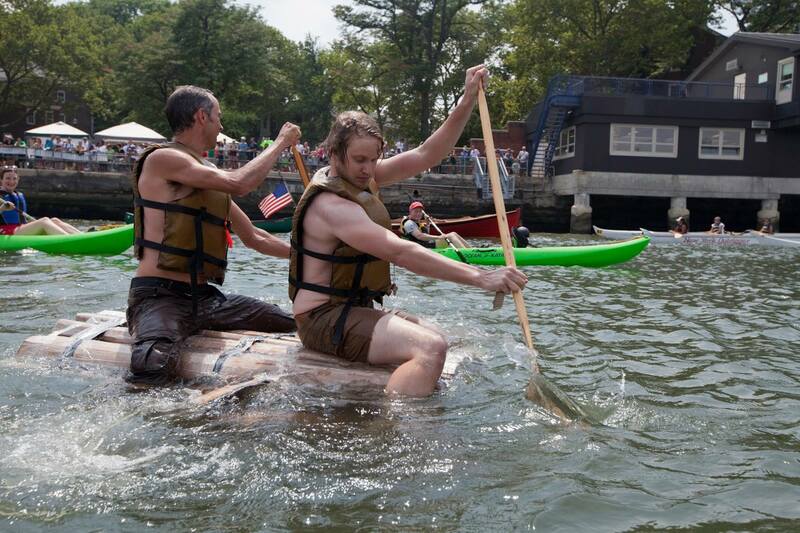 Please also email volunteer@harborlab.org with the subject line “Oyster Paddle” if you’d like to paddle and help. It’s exciting for HarborLAB to play a small role in seeding great maritime education programs in western Queens! 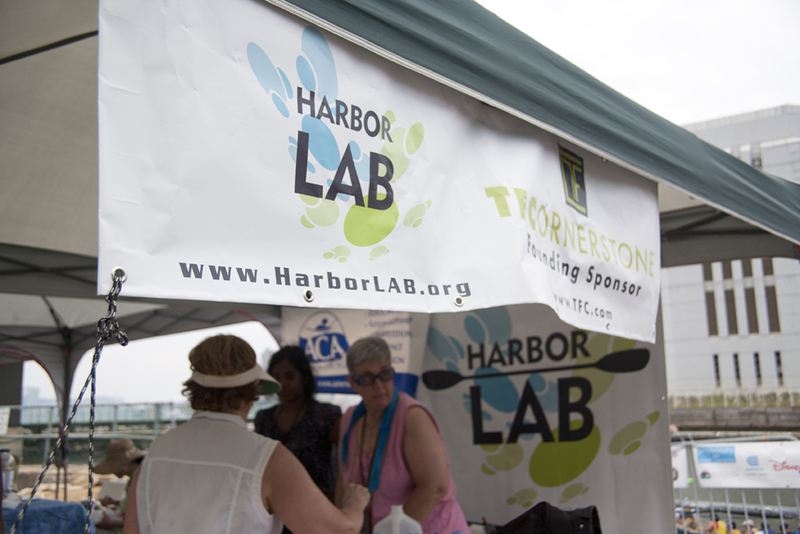 HarborLAB and NY Harbor School are unrelated organizations with shared goals. HarborLAB Founder Erik Baard invited NY Harbor School Founder Murray Fisher to Long Island City six or seven years ago to meet with a landlord and others about encouraging the establishment of a middle school that might graduate students into the NY Harbor School. Erik also lobbied then-City Council Member Eric Gioia for an estuary-themed middle school. Flash forward some years and Hunter’s Point Community Middle School Principal Sarah Goodman independently had such visions. Ms. Goodman grew up learning about marine ecology and stewardship in New England. 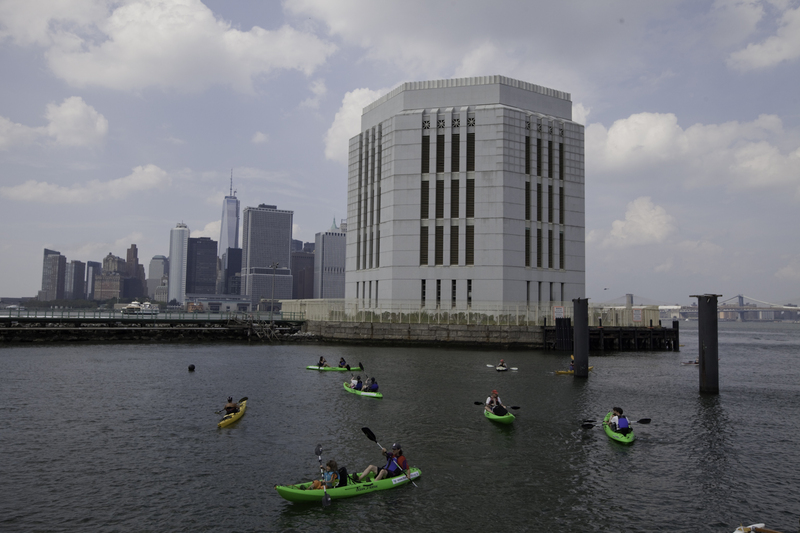 HarborLAB looks forward to being the Hunter’s Point Middle School’s on-water partner, perhaps in concert with CUNY LaGuardia Community College and other community environmental groups and agencies to which we introduced Ms. Goodman. 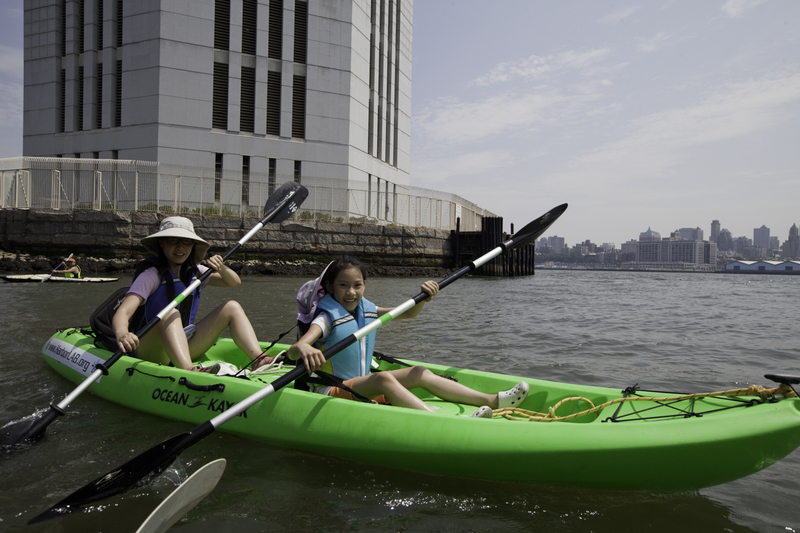 While the nearby waters of Anable Basin, site of great contamination by Standard Oil generations ago, are likely unsuitable for children (especially in sit-on-top kayaks), HarborLAB will arrange educational field trips and will continue to advocate for paddling in Gantry Plaza State Park. We also strongly advocate for an Anable basin cleanup, and have lobbied for this with state officials and local developers. 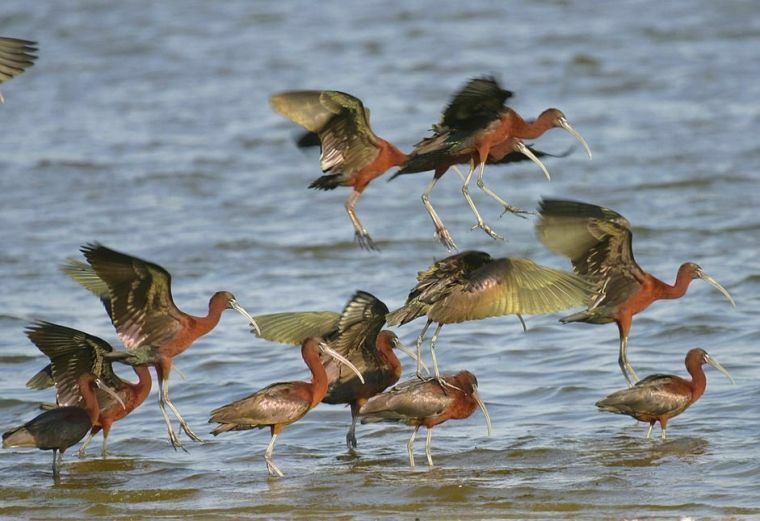 Glossy ibis flock in Jamaica Bay. Photo by Don Riepe, American Littoral Society. This is a wonderful chance to share a day of fun and learning with Hour Children, a nonprofit dedicated to help families get on a positive, healthy, and productive track after a mother’s incarceration. Many of the kids were born in prison, or are being mentored while their mothers are incarcerated. Hour Children also provide neighborhood services, like summer and after school programs, a food pantry, educational aid, job search and training, and thrift shops. Hour Children’s LIC neighborhood includes three large NYCHA residences. 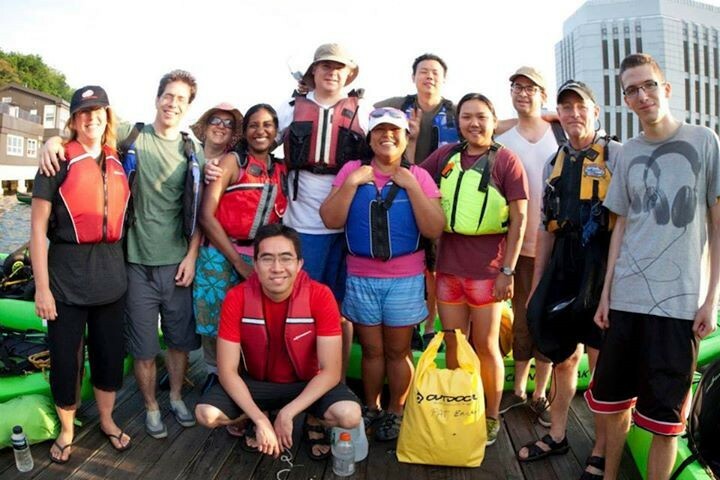 Here are photos from the last time our volunteers took the kids paddling. Here’s our Facebook event page for this outing. 8AM: We’ll meet outside My Mother’s House, Hour Children’s supportive housing program (3630 12th St, Long Island City, NY). 830AM: Drive to Jamaica Bay Wildlife Refuge. 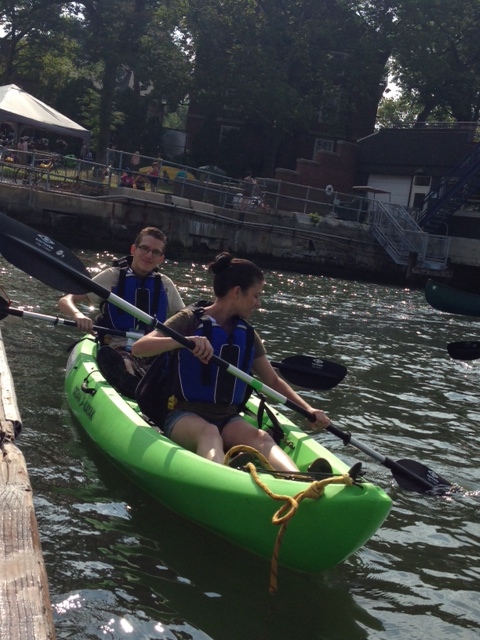 Paddle to explore the bay with mature teens and enjoy walk-up paddles for the younger kids. 130PM: Go to Jamaica Bay Wildlife Refuge Visitor Center (http://www.nyharborparks.org/visit/flbe.html). 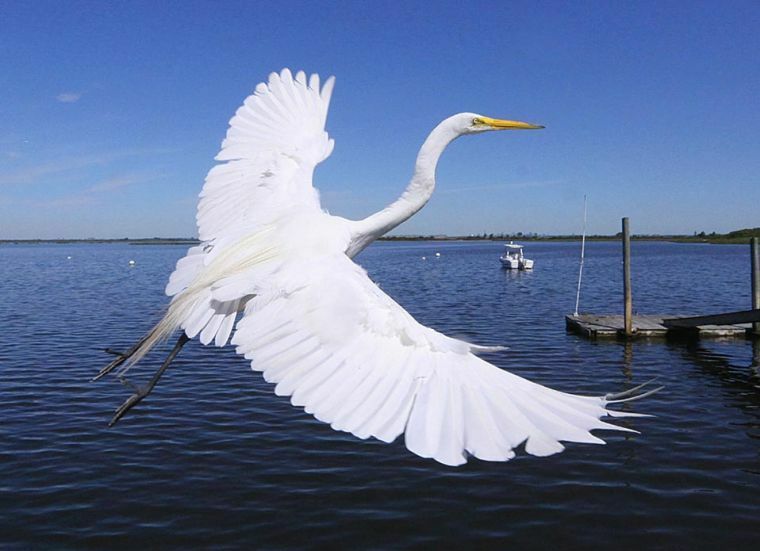 Jamaica Bay is Grand Central for birds migrating through our city, and home to diamondback terrapin turtles, horseshoe crabs, all manner of fish, and more! You’ll be giving the kids a great experience and maybe scoring some amazing nature photos to boot! Banner photo by Don Riepe of the American Littoral Society. Thanks to a new sponsor we expect to soon announce, and with whom we plan to visit Jamaica Bay, we purchased a boat trailer to get our fleet to the site! We’re also grateful to Jersey Paddler for the considerable discount it is offering on our trailer. For Orchard Beach Lagoon fans, no worries — we’ll go there soon too! Jamaica Bay. Photo by Don Riepe, American Littoral Society. Howard Hemmings Joins the Board! Howard Hemming, left, with HarborLAB volunteer Gil Lopez at :the Smiling Hog’s Head Ranch urban farm in LIC. 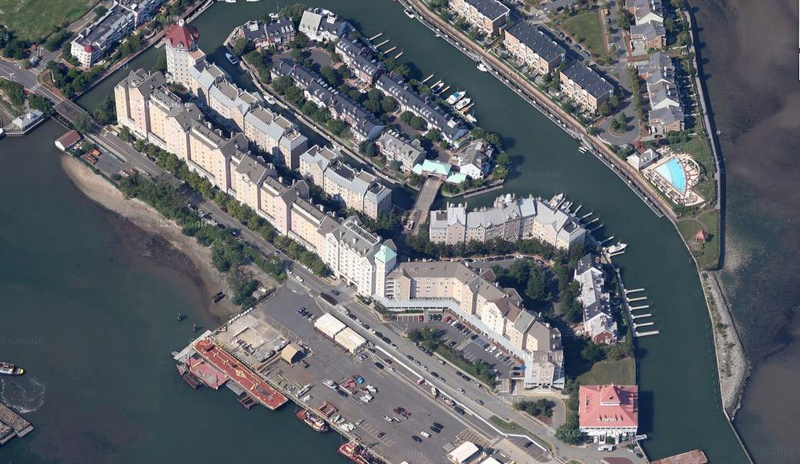 The HarborLAB launch will be stabilized and beautified with plantings (many of them edible) under Lopez’s landscape design direction and in consultation with the NY State Department of Environmental Conservation. Photo by Erik Baard. HarborLAB welcomes a new board member, Howard Hemmings! Mr. Hemmings is a Community Coordinator with the Department of Resident Engagement at the NYC Housing Authority (NYCHA). His leadership further ensures that HarborLAB will always, and with emphasis, serve the youth who most need science educational inspiration and healthy, outdoor recreation. 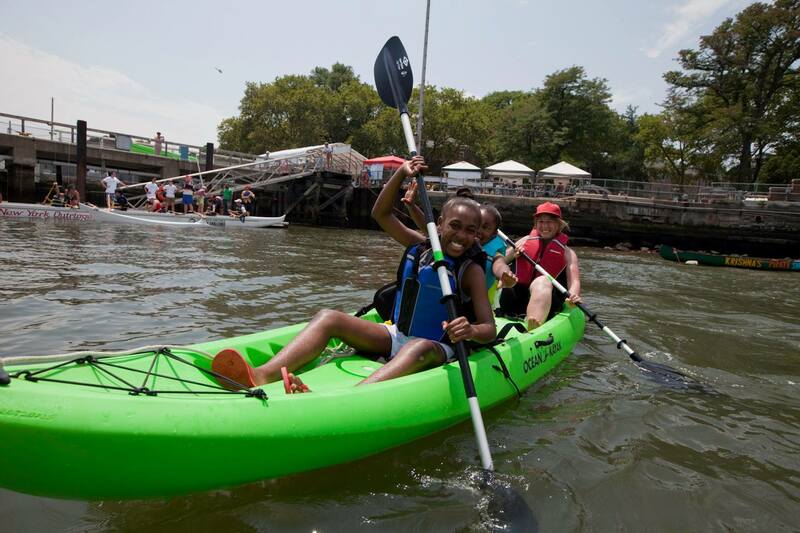 We look forward to including free HarborLAB activities in NYCHA community calendars and newsletters, to growing with NYCHA resident volunteers and future leaders, and to helping NYCHA residents start their own environmental and paddling programs. Lisa Belfast, Manager After School Programs, Hour Children. Howard Hemmings, Community Coordinator, Department of Resident Engagement, NYCHA. Joel Kupferman, Esq. Founder of the NY Environmental Law and Justice Project. Holly Porter-Morgan, Ph.D. Director CUNY LaGuardia Community College Environmental Science Program. Scott Sternbach, CUNY LaGuardia Community College Photography Program Director. Mr. Hemmings is a graduate of Colgate University. He serves as a delegate of the Social Service Employees Union Local 371. 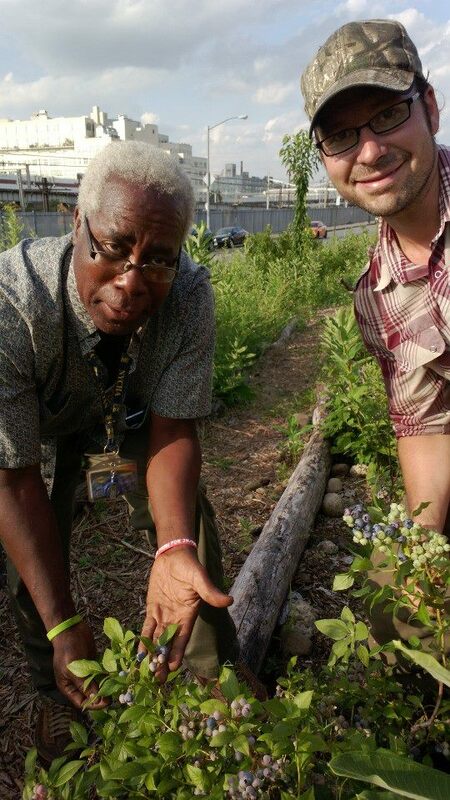 For the past fifteen years he has served as a Garden Coordinator for the New York City Housing Authority where he strives to provide environmental education opportunities for youth and seniors. NYCHA’s Garden and Greening program is the largest and oldest such program in the U.S.
Mr. Hemmings is a Bronx resident who grew up in Bushwick Brooklyn. He’s an avid bicyclist and community gardener. We’re thrilled to be enlightened by Mr. Hemmings’ wisdom born of studies and experiences with this vital population. Thank you, Mr. Hemmings! 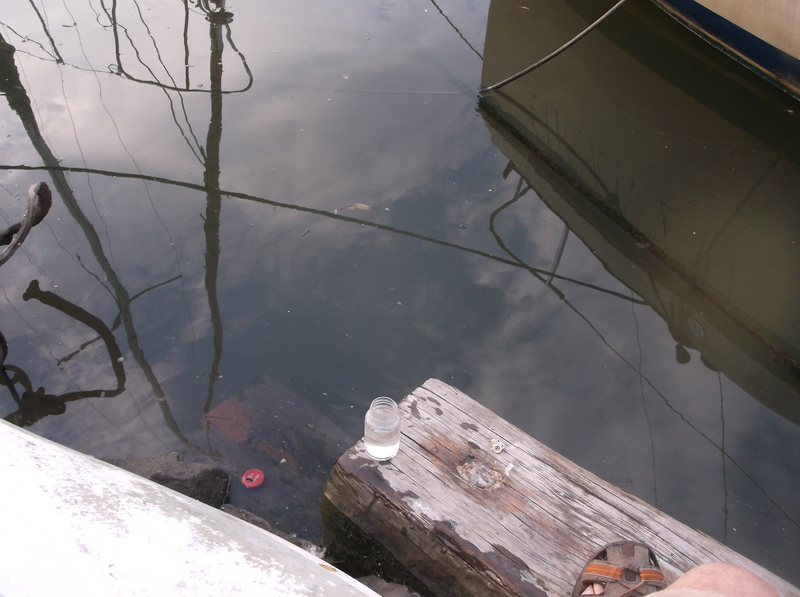 Vial on beam at Newtown Creek launch sampling site. Photo by Emanuel Steier. 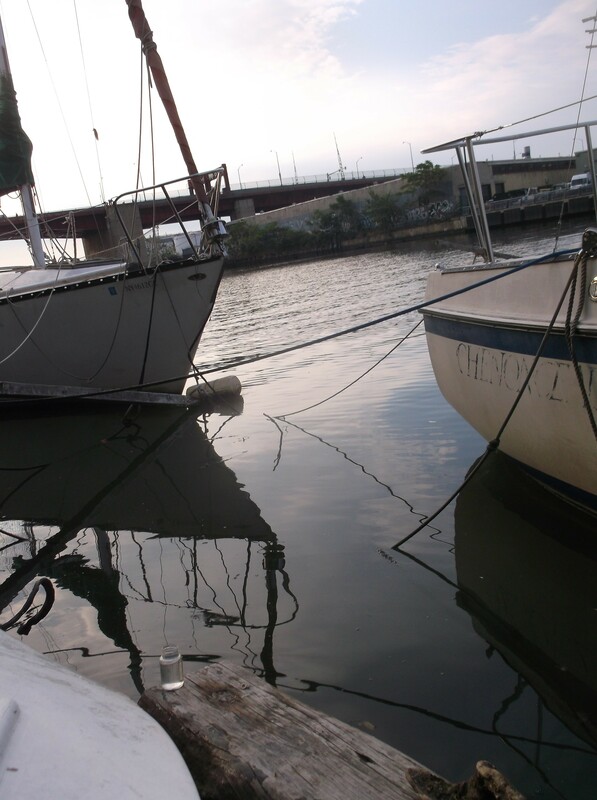 Before HarborLAB had a single boat, we initiated weekly “citizen scientist” water sampling in Queens and Randalls Island through the NYC Water Trail Association. The River Project was the first testing center for this program, which is funded in part by the Lily Auchincloss Foundation. We soon invited the environmental science program at CUNY LaGuardia Community College to participate in the program (HarborLAB’s board includes faculty from the college). 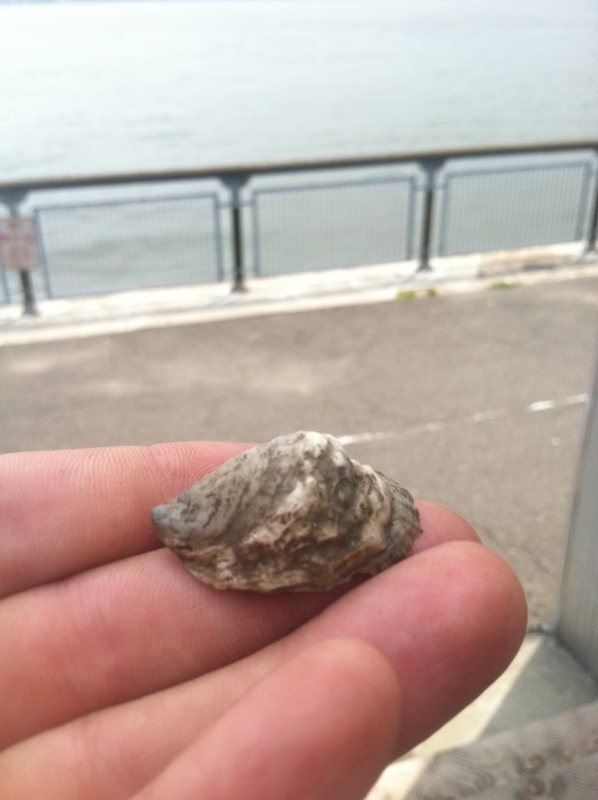 This year The River Project is our testing site again, so we must deliver samples in cooler packs to Pier 40 in lower Manhattan (Hudson River at West Houston Street). That’s a great opportunity for our newer volunteers to meet a model estuary education nonprofit, but also a logistical stretch. 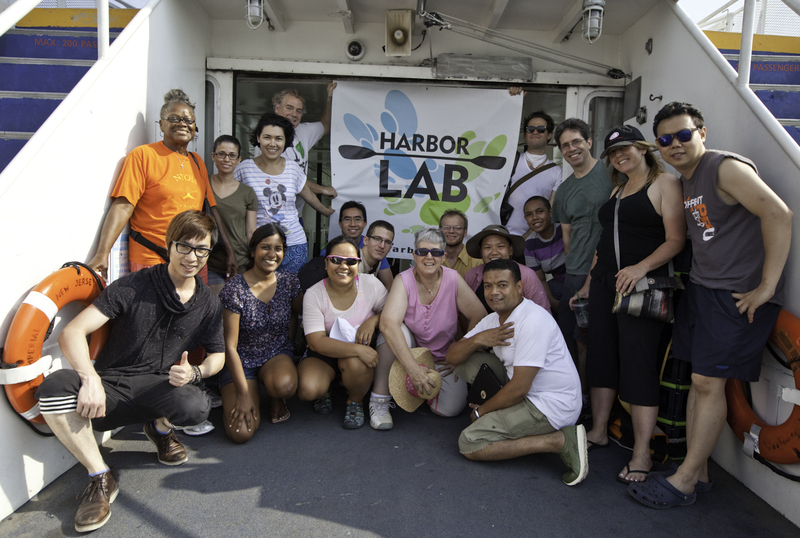 Now that HarborLAB has found its sea legs this summer — launched our fleet and held programs across the harbor — we’re recommencing our citizen scientist participation. 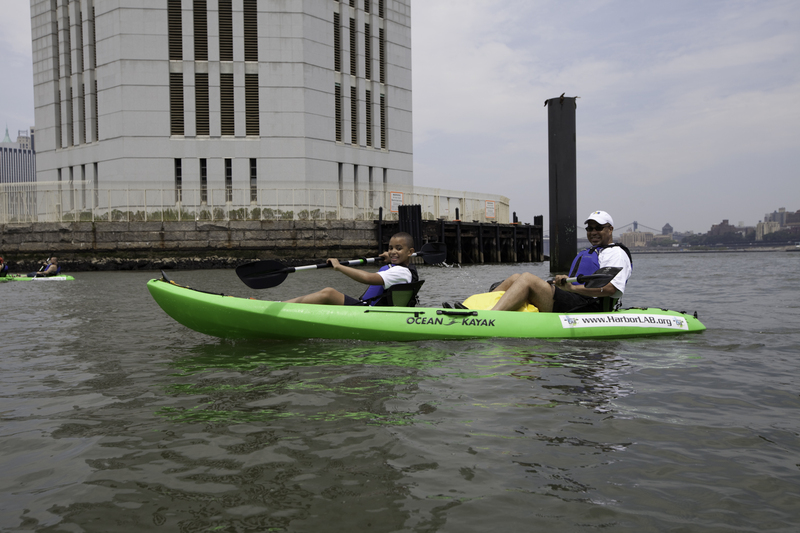 On August 1, Emmanuel “Manny” Steier biked to our Newtown Creek launch and sampled water about six inches deep. If you’d like to participate, please click onto our Facebook event page here. This program tests for intestinal bacteria, but sewage is only one risk factor in western Queens. 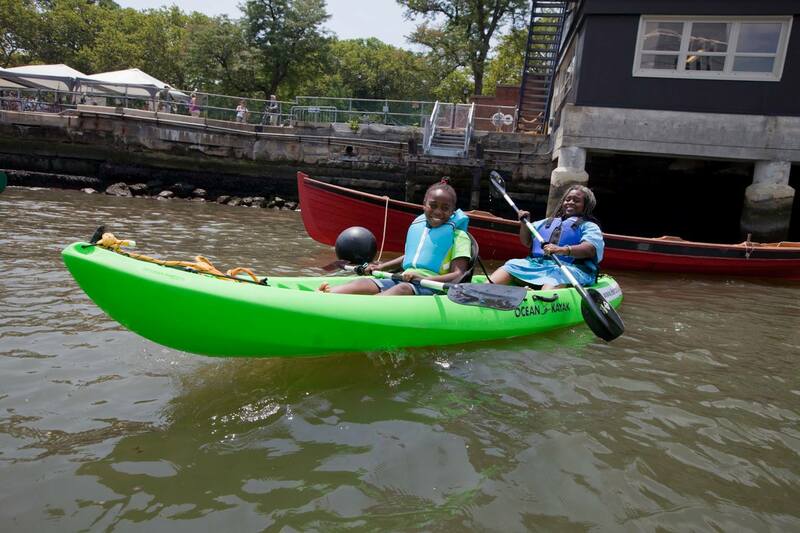 HarborLAB opposes sit-on-top paddling for children in western Queens sites like the Newtown Creek, Anable Basin, and Hallets Cove. This is because bacteria levels are frequently high in these locations — especially Hallets Cove — and also because we struggle with the consequences of industrial pollution from generations past. The Newtown Creek is an Environmental Protection Agency-designated Superfund Site because of sediment contamination and because Standard Oil caused our nation’s largest urban petroleum spill. Anable Basin, a former Standard Oil barge slip, has been described by some as a potential “mini-Newtown Creek” because the adjacent land was so fouled by underground refineries that the Queens West development required massive soil remediation. Indeed, as the Queens Chronicle notes, “steel sheeting had been installed to keep outside pollution from seeping into the site.” That is, the residential site needed to be protected from pollution from Anable Basin. So while we are huge fans of testing for bacteria, western Queens requires more comprehensive testing as soon as funding allows. Moreover, we must all show restraint despite kids’ welcome eagerness to paddle — lobby hard for cleanups now, and then provide programs when conditions are better. Recreational programs should be truly controlled by the community and subject to the informed judgment of voting parents. 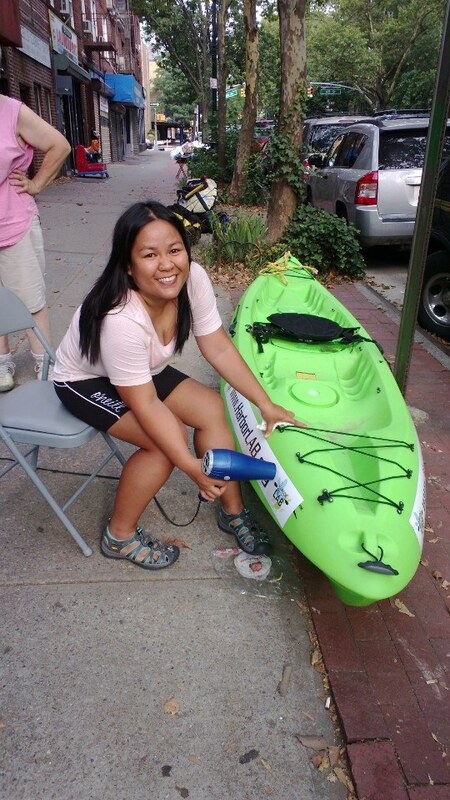 No sign-on-the-fly liability waiver can reasonably empower parents to place children in wet-riding sit-on-top kayaks into such highly polluted waters. Sample drop box at The River Project. Photo by Emanuel Steier. 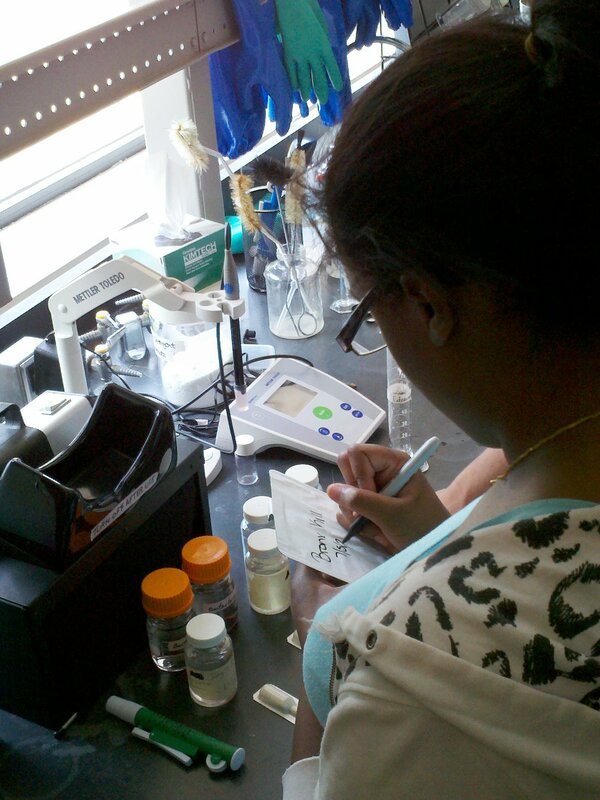 2012 testing at LaGuardia Community College. Photo by Erik Baard. Volunteer Co-Manager Caroline Walker takes two kids out in the embayment while the rest of their family shared another boat. Photo by Scott Sternbach. 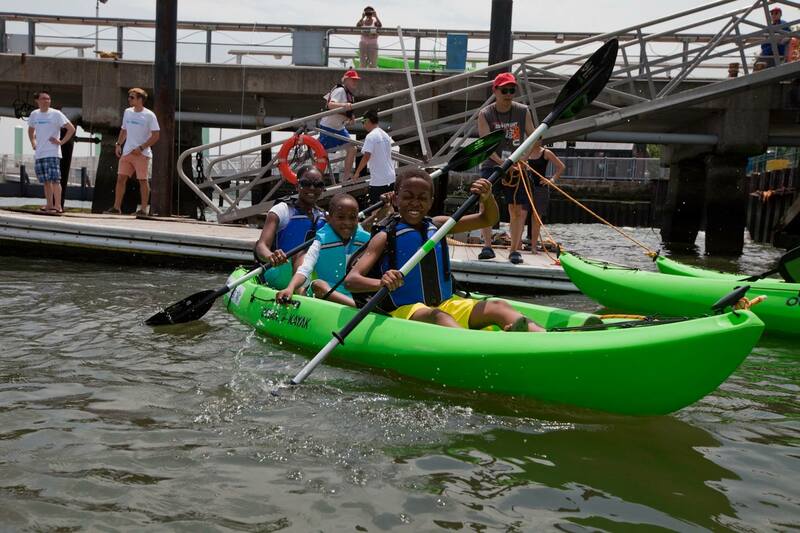 HarborLAB was honored to serve at the Metropolitan Waterfront Alliance‘s request as the public kayaking program at the Governors Island center of City of Water Day, the largest annual harbor festival in our region. We enjoyably and safely shared a very busy little dock with New York Outrigger and East River C.R.E.W. (Community Education and Recreation on the Water) rowers. 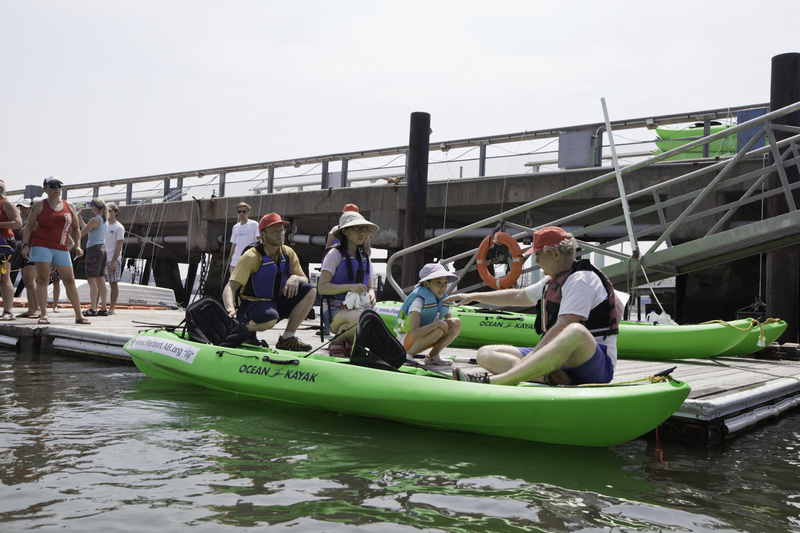 We set 146 members of the public afloat within the protected Pier 101 embayment between 11am and 4pm, despite the happy interruptions of arriving groups of kayakers, stand-up paddle boarders, and canoeists, and a wildly popular and zany cardboard kayak race. We couldn’t have achieved these good things for the community without the support of our sponsors and allies. At this event we were proud to fly sustainably produced banners that included both our logo and those of TF Cornerstone, Con Ed, and the United Nations Federal Credit Union. 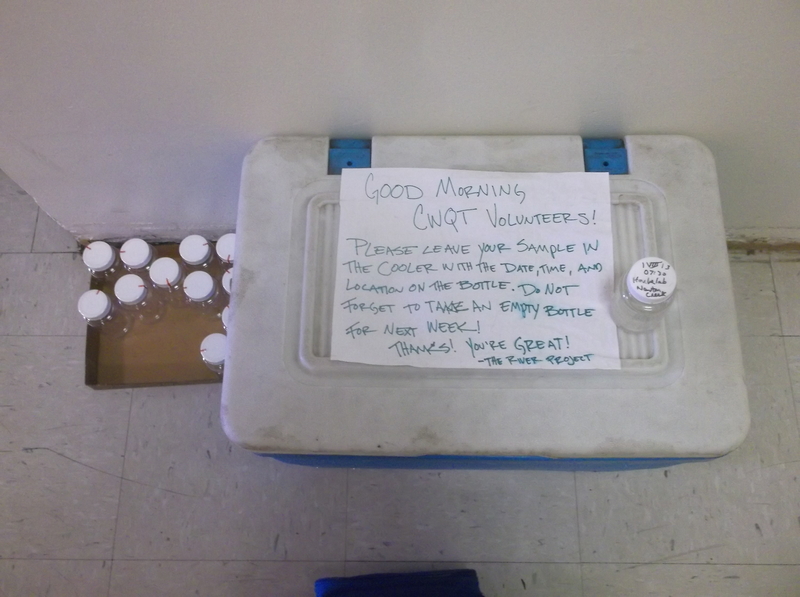 HarborLAB was represented by two dozen volunteers, students, and supporters. 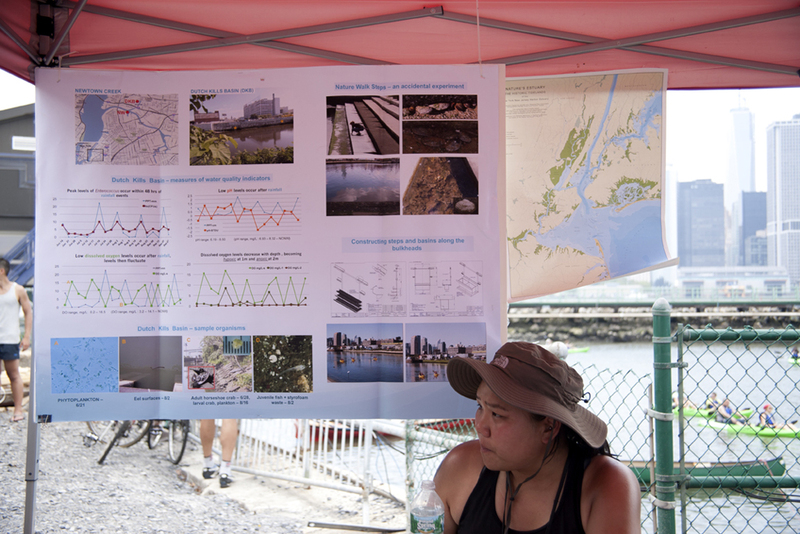 CUNY students, especially LaGuardia Community College, were especially helpful in our estuary and watershed education tent. They also documented the day’s attractions. Our dock was staffed throughout by Daisy Hope Benjamin, an emergency room nurse with child and adult life saving certifications, as an added level of safety. She was also just great company on the dock! The day’s on-water safety and event production, under which we served, was directed for MWA by Ray Fusco, whose professionalism and kindness made this hard work for public benefit a pleasure. Metropolitan Waterfront Alliance officials described our program variously as “brilliant,” “great,” and “amazing.” Our success follows similar raves at the Clearwater Festival. Though this is our first season, our core volunteers have years of service on the harbor under their belts, or life vests. 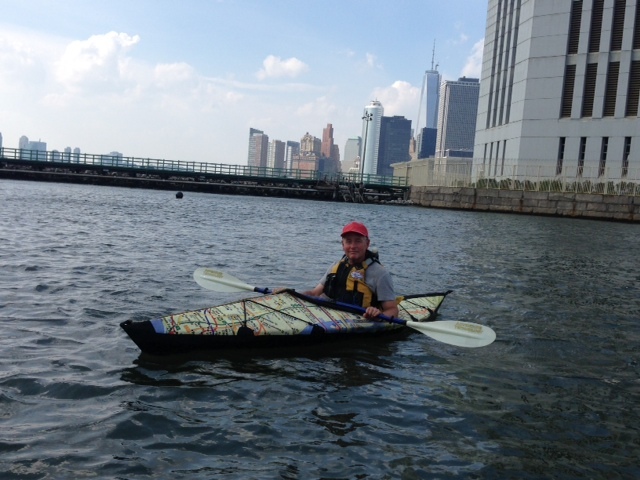 Founder Erik Baard has a special tie to City of Water Day — he started the Five Borough Harbor Ramble (the first event through which paddlers and rowers touched all boroughs), which MWA aided greatly (special thanks to Carter Craft!). When the MWA asked to adopt the Ramble as its fully-owned signature annual event, Erik joyfully agreed. Since then the MWA has rebranded the event using the title of its excellent documentary, and profoundly grown City of Water Day as no other organization could. The day started in Sunnyside, Queens, where our boats are temporarily stored at the private office of Community Board 2 Environmental Chair Dorothy Morehead. Our great innovation of the morning was to heat seal sustainably printed decals to our boats using a blowdryer. 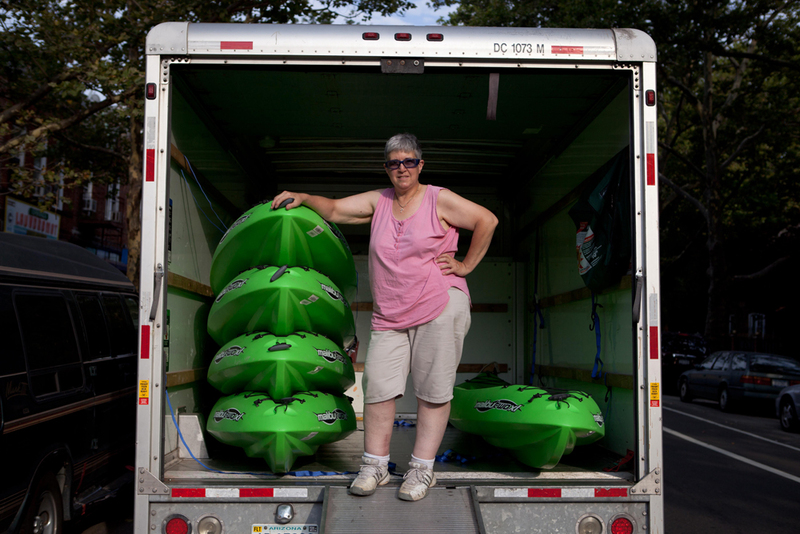 Thanks to a Harbor Estuary Program grant for City of Water Day, we rented a box truck to carry boats — we URGENTLY need a trailer (sponsor our purchase of this 16-boat trailer!) and often shuttle boats bit by bit in a HarborLAB Facilities Manager Pat Erickson’s van, but our volunteers had enough work ahead of them. A huge help came from NY Waterway, which sent a special East River Ferry to Hunters Point for HarborLAB to get boats, gear, and volunteers to Governors Island ahead of the crowds. Operation Manager EJ Lee on decal duty. ER Nurse Daisy Benjamin brings fantastic precision to her work. 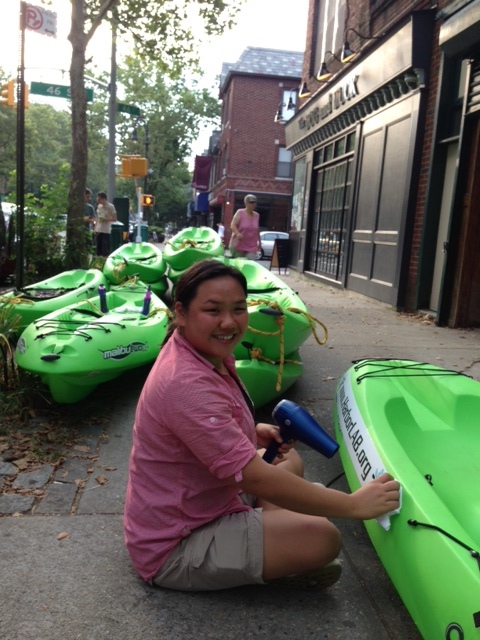 Facilities Manager Patricia Erickson with six of our ten Ocean Kayak Malibu 2 XL tandem sit-on-top kayaks. HarborLAB’s morning crew of volunteers and supporters. Photo by Scott Sternbach. On the island, gear was transported to Pier 101 by Ray Fusco’s van. Volunteer Emanuel “Manny” Steier had a creative solution for moving the boats! Volunteer Zamira Kamal takes a quick, well-deserved break. Photo by Ana Espinal. HarborLAB volunteers operated two tents, one of which we brought to the island aboard the ferry. The first held waivers and great safety and stewardship information from the American Canoe Association (HarborLAB is a Paddle America Club). The second, red canopy was our estuary and watershed education desk. 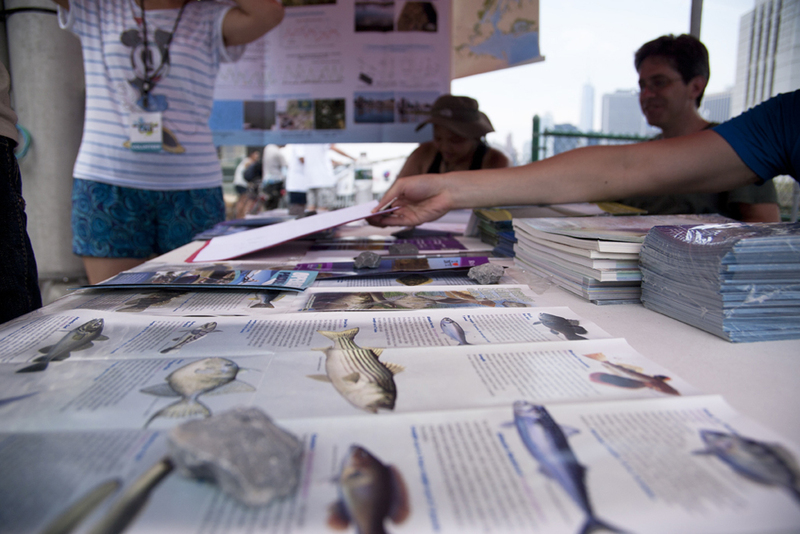 At that table we highlighted CUNY LaGuardia Community College research and provided literature from the Harbor Estuary Program, NY State DEC, NYC DEP, ACA, and other great environmental groups and agencies. 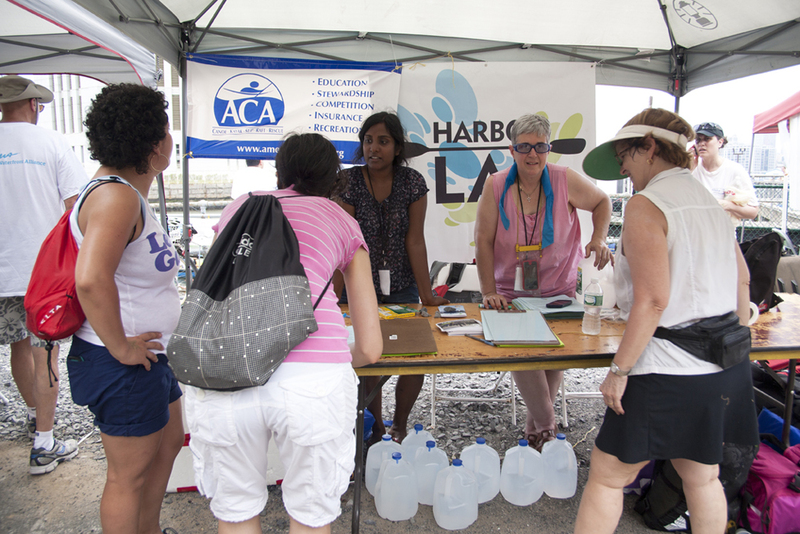 Volunteer Co-Manager Danushi Fernando and Facilities Manager Patricia Erickson staff the HarborLAB waiver and American Canoe Association information table. Photo by Ana Espinal. Operations Manager EJ Lee at the education table. Photo by Ana Espinal. Teacher David Perrin flanked by EJ Lee and Vernon ShengWuey Ong at the education table. HarborLAB’s education table. Photo by Ana Espinal. Down on the ramp, dock, and water our volunteers had a blast despite the pressures of managing crowds and coordinating safe sharing of the embayment. It helped that NY Outrigger and East River C.R.E.W. are both friendly, community-spirited, and highly competent groups. Working shoulder-to-shoulder with them was a privilege. A beautiful East River C.R.E.W. boat captained by Mary Nell Hawk. 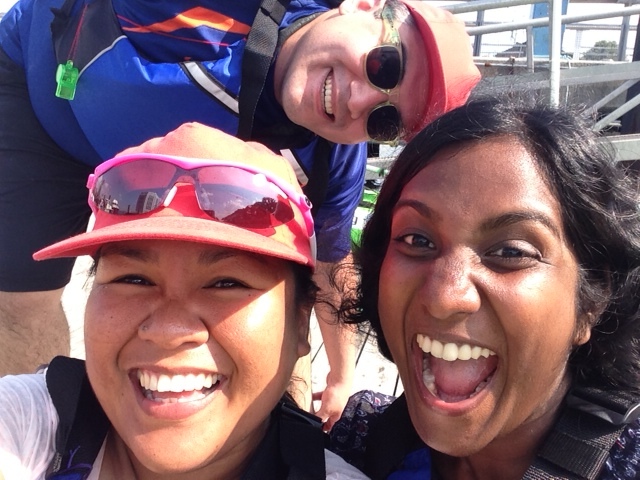 Volunteers Omar Barrios, Daisy Benjamin, and Danushi Fernando sharing a laugh on the dock. Steve Sanford on safety patrol in the MetroBoat, HarborLAB Founder Erik Baard’s mass transit and estuary “brain child” with Folbot (http://folbot.wordpress.com/tag/metroboat/). 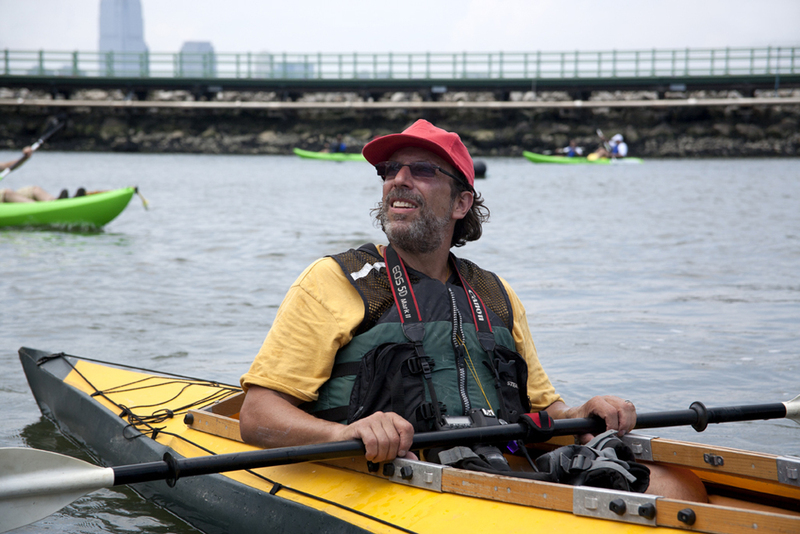 HarborLAB Board Member Scott Sternbach, CUNY LaGuardia Community College photo director, on safety patrol in his own boat. Photo by Ana Espinal. 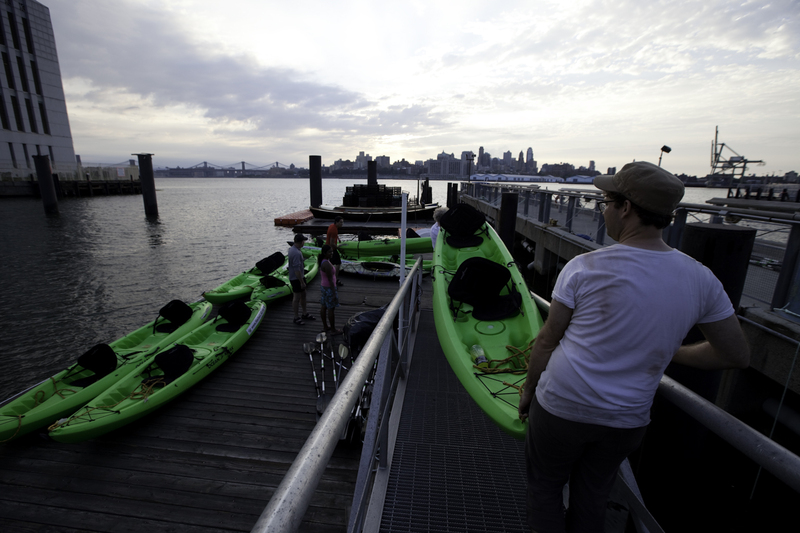 Erik Baard managed kayak group arrivals during program hours to keep the dock from getting dangerously crowded. 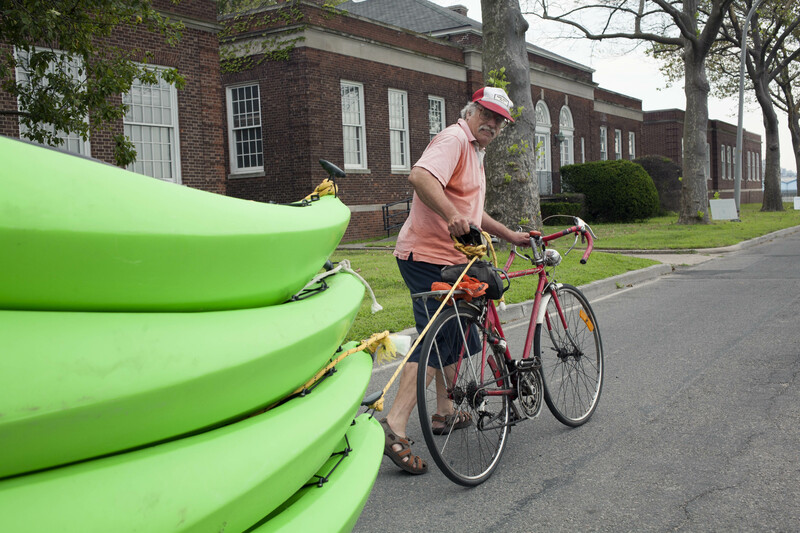 Here he holds HarborLAB boats out on the water while LIC Community Boathouse (also founded by Erik Baard), Yonkers Paddling and Rowing Club, and Sebago Canoe Club boats arrived in one flotilla. 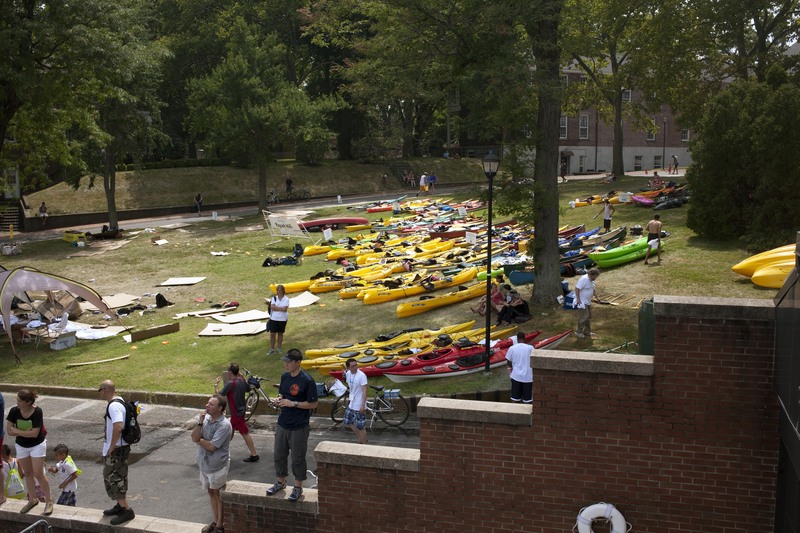 “Boat Hill” fills in as paddling groups arrive. 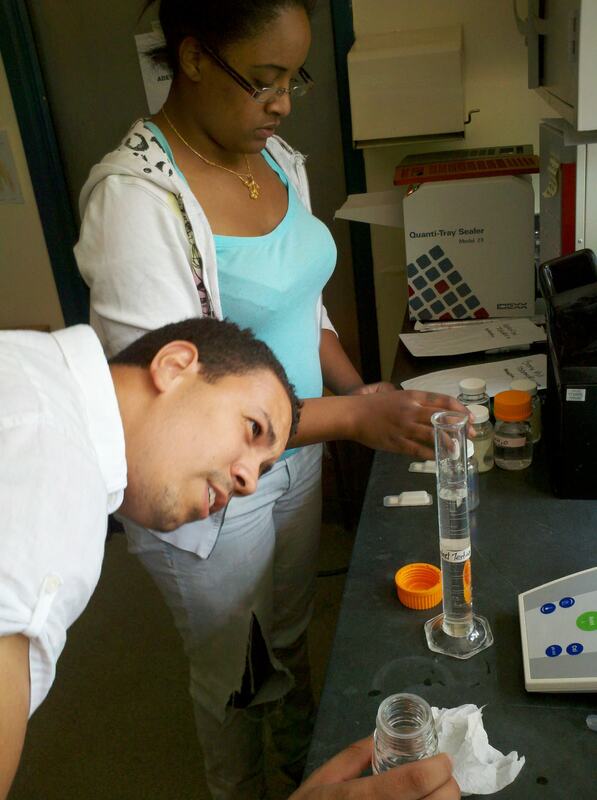 CUNY students and HarborLAB volunteers George Blandino-Ripley and Ana Espinal. The go-go Greenpointers of the North Brooklyn Boat Club who impressed us all with determination and filled us with envy that they got to take a swim. Photo by Scott Sternbach. Part of the afternoon HarborLAB crew. Yes, a bunch of us pulled double shifts! 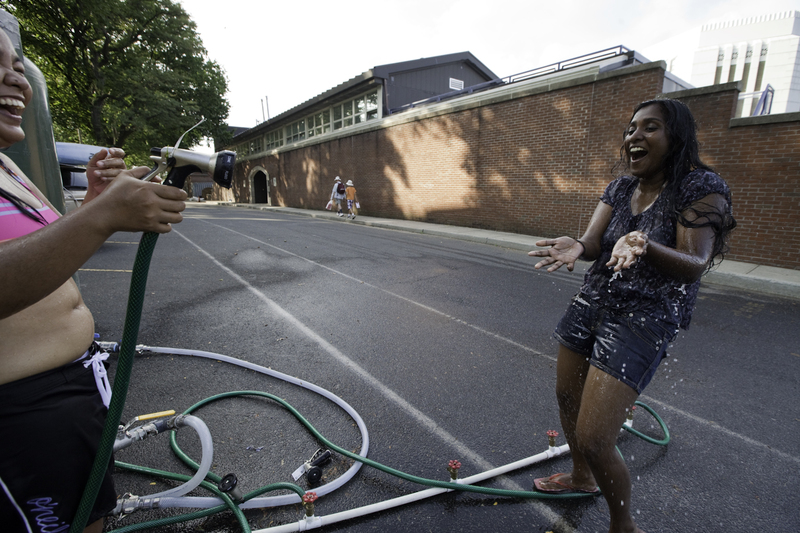 Even a hose shower was a blessing. 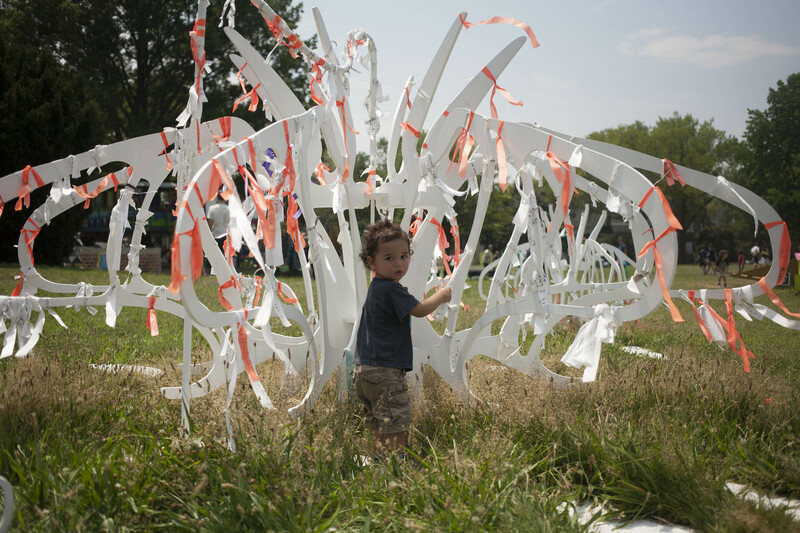 Students and volunteers enjoyed exploring the island, which is rich in art. Photo by Daniel Cassady. At least half of us camped over on the island. Sunrise over Brooklyn. Time to go home. Daniel Cassady and the rest of the crew carried boats down for an early launch.